This scenic, family-friendly city has realized its founders’ dream. 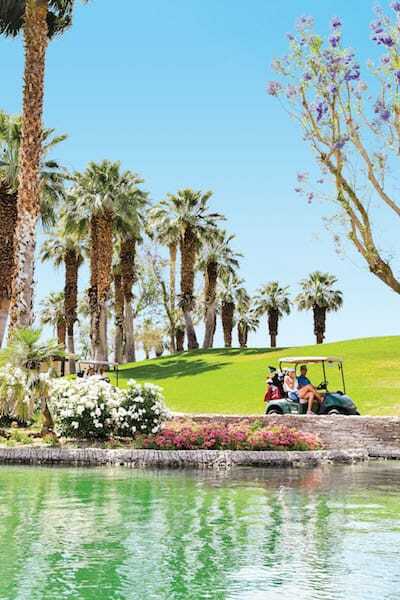 With its rolling parks and mountain hiking trails, award-winning fairways, art walks, zoo, and high-end retail, there is always something new to discover in Palm Desert. The area’s central location and natural beauty attracted magazine publisher Randall Henderson and his brother Cliff, who in the 1940s saw the potential to develop a thriving resort destination. The brothers transformed a patch of vacant desert into the Shadow Mountain Club, attracting Hollywood A-listers like Jimmy Stewart and Bing Crosby. Later they founded the El Paseo Shopping District, and country clubs were soon sprouting up across the burgeoning community. Through the 1980s and ’90s, the desert city was among the fastest growing in America. 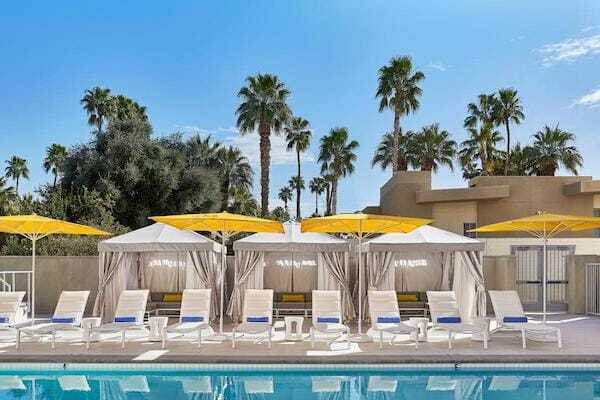 Now the backdrop for Fashion Week El Paseo, the celebrity-chef-driven Palm Desert Food & Wine festival, a vibrant farmers market and weekend street fair, and Greater Palm Springs’ higher-education facilities, the scenic, family-friendly city has realized its founders’ dream. For one of the most expansive views of the valley, ascend the sidewinding Palms to Pines Highway to Vista Point, then visit the Santa Rosa and San Jacinto Mountains National Monument to learn about the land. Here are suggestions from the September 2018 The Guide on where to stay in Palm Desert. Chilean flamingos at JW Marriott Desert Springs Resort & Spa. J. W. Marriott Desert Springs. The welcoming committee at the JW Marriott congregates around the entryway lake in a quintessentially Greater Palm Springs pink-feathered uniform. Only for this flamboyant crowd, the finery is au naturel. 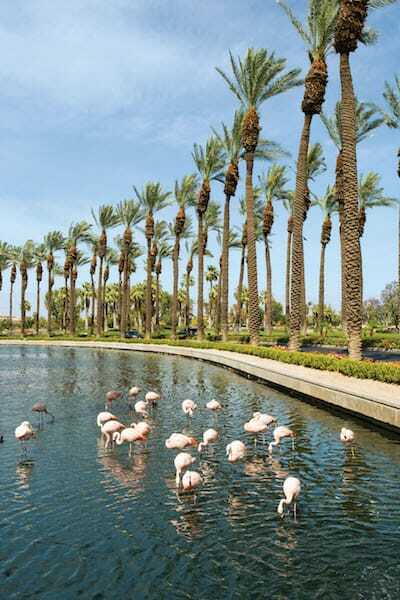 The resort does double duty as a wildlife sanctuary, and the Chilean flamingos are only some of the exotic residents who call the lush 450-acre property home. A fleet of restaurants, shops, and serpentine pools ringed in palm trees deliver getaway vibes in spades — to reach your dinner reservation, you’ll depart from the lobby in a boat. If recreation is your M.O., the property has two Ted Robinson–designed championship golf courses; an 18-hole putting course; hard, grass, and clay tennis courts; and motorcycle rentals. Regular family activities include bird chats, yoga sessions, and evening movies and magic shows. Wind down at the 38,000-square-foot spa, which features frequent package specials on an assortment of treatments, from paraffin soaks to ayurvedic healing rituals. A hop, skip, and a jump from the El Paseo Shopping District, this quaint desert lodge strips back frivolous amenities to provide a stay that’s reminiscent of a visit to grandma’s house. Rooms offer pool or mountain views and vary in size from standard one- or two-bed studios to a duplex with two bedrooms, two bathrooms, a full kitchen, and a private pool. The décor is dated, but in a homey way, and service is laid-back — it’s the No. 1 reason guests become repeat visitors, making the inn their go-to desert home away from home. Rent a villa or bring your own RV to experience Palm Desert’s 33-acre destination for the recreation-minded. Emerald Desert has four pickleball courts, a putting green, and gym and offers membership opportunities with the private Avondale Golf Club. For those traveling with canines, the resort has a number of dog parks and is nearby the city’s various hiking trails. While you’re out on the town, take advantage of the RV detailing services. Or lay low with a spa treatment and a dip in the pool, and enjoy the desert climes. Guests milling about poolside cabanas, playing lawn games, downward dogging at sunrise yoga before breakfast, and turning back the clock with 24-karat gold facials at the on-site Spa La Lé find it hard to fathom El Paseo without its own signature hotel. You might check in feeling frenzied, but everyone checks out relaxed and sated. In the short time since this Marriott Autograph Collection property debuted in March 2018, laid-back, luxury accommodations have become the new normal. 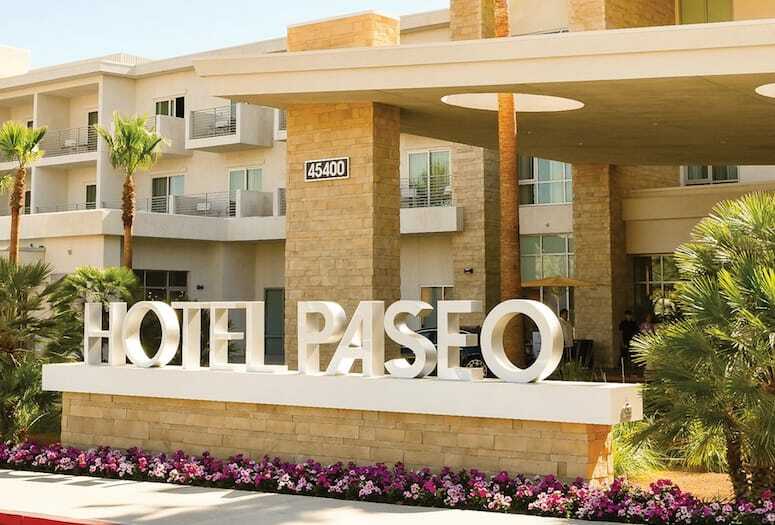 Guests are drawn to Hotel Paseo’s ideal location, just off Palm Desert’s retail avenue, and its vicinity to golf, hiking, and other outdoor adventures. (Although you might never leave the grounds — the pool, bar, fire pits, and spa guarantee a stay full of relaxation. Retreat to a well-appointed guest room or one of nine specialty suites, most with private balconies. Rooms are bathed in soft gray, white, and light-blue tones; all include plush beds with fine linens and barn doors that open to luxurious, spa-inspired bathrooms. 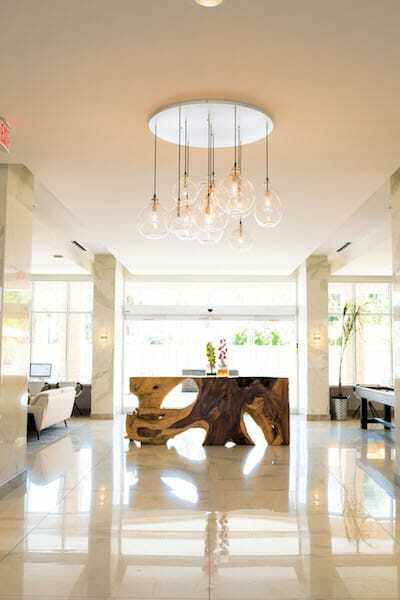 The lobby at Hotel Paseo. A dog-friendly property, Hotel Paseo not only delivers a pampering experience for people but also for pups complete with a chalkboard welcome sign, treats, elevated bowls, and cozy dog beds. Those seeking a venue to host an unforgettable event can work with hotel staffers to plan a celebration for 10 to 300 guests on the expansive event lawn, which features a 1950s Airstream trailer, or in the Grand Paseo Ballroom with catering by AC3 Restaurant + Bar.